It’s the 1950s and Ellis Lacey is living in Ireland with her mother and older sister. She wants to be an accountant but is only a shop assistant. Thanks to her sister, she can emigrate to America where she’s hired in a shop, goes to an accounting school and betters herself. Here, she meets a young Italian man and begins a relationship with him. After tragedy strikes, she has to decide whether she will stay in America or go back to Ireland. The novel has four parts. The first is set in Ireland and on the ship crossing over to America, the second and third are set in Brooklyn, the last in Ireland. Ellis is a passive character but interesting as she’s introspective and a keen observer of what happens around her and inside of herself. I loved reading about the way she processed things that had happened to her during the day. In the beginning this passivity isn’t exactly attractive but it’s not as infuriating as it is in the last part. Ellis never speaks up, never fights for herself and in the end, she pays a high price for this behaviour. One aspect that stood out for me was the way Tóibín wrote about the experience of being an immigrant. I’ve lived abroad a few times, in some cases in places where I knew hardly anyone. Many of the feelings described, brought those experiences back. Here’s a quote showing Ellis in the shop she’s working in Brooklyn. The morning was full of frenzy; she did not for one moment have peace to look around her. Everyone’s voice was loud, and there were times when she thought in a flash of an early evening in October walking with her mother down by the prom in Enniscorthy, the Slaney River, glassy and full, and the smell of leaves burning from somewhere close by, and the daylight going slowly and gently. This scene kept coming to her as she filled the bag with notes and coins and women of all types approached her asking where certain items of clothing could be found or if they could return what they had bought in exchange for other merchandise, or simply wishing to purchase what they had in their hands. Ellis may be the main character but there are numerous other characters, some who only appear briefly. They are all complex and rich in facets. One could also say that the two main settings, the eponymous Brooklyn and Ireland are treated like characters. They are described in detail, juxtaposed, compared, contrasted. Two very distinct worlds come alive between these pages. I highly recommend Brooklyn. It’s beautiful and I can’t wait to read more of Tóibín. Just be warned – Ellis can, at times, be an infuriating character. If you’d like to read a more in-depth review here’s Max’s take on the novel. If you enjoyed this one which you clearly did, then I highly recommend his novel Nora Webster – i actually think its a better novel…..
You’re the second person to say that. So I really have something to look forward to. Thanks for telling me. And I shall be the third in that case, for I too, was about to suggest Nora Webster. Though be warned – Nora is also predominantly passive! Thanks, Sandra. It sounds like I should read it. I think I’ve got THe Master already, so I might read that first but I’m looking forward to Nora Webster. Thanks for the warning and for the kind words about my blog. So glad you enjoyed this novel, Caroline. I agree, Toibin’s prose is luminous, in a very quiet, understated way. 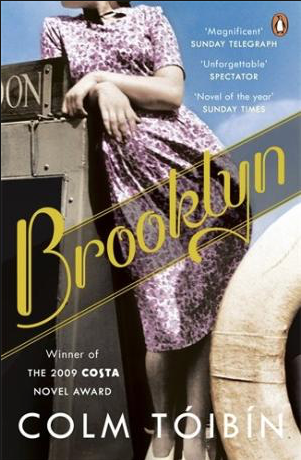 I read Brooklyn last year but decided not to write about it in the end as I’d already written a couple of pieces about Nora Webster. To tell you the truth, I felt a little wrung out by the experience of reading these novels, especially given that Nora’s story in particular reminded me so much of certain elements of my mother’s own life. (Like Nora, she grew up in Ireland and lost her husband way too early.) I think you would enjoy Nora too, but it might be best to put a bit of space between the two books. Thanks, Jacqui. I did like it a great deal. Quiet and understated, that’s what it is. I can imagine that it got to you if your mother’s story was similar. I will put some space between them, especially since I already own a collection of short stories and The Master. I remember you mentoned Brooklyn but when I looked for the review I couldn’t find it. I think it’s a book you can enjoy anyway. Sure, a few things will not be new but since the writing is so amazing, you will like it, I’m sure. I really want to read this. I have a couple of books by Colm Toibin and particularly loved Nora Webster. Now I wish I had a copy of Nora Webster! I hope you will like this as much as I did. Nora WEbster is a charcater in this one too. It is interesting that the protagonist considers a return to Europe. I think that it is a little known fact that a fairly high percentage of immigrants to the United States did this. I have never heard of anyone writing about it. I wished more than once I could make her move or speak up. I can’t think of another book who looks at the return. In the end, Its only a temporary return because something happens. I, too, very much enjoyed reading ‘ Brooklyn ‘ as I did watching the film. which is what introduced me to Colm Toibin. I enjoyed that book too. I have had mixed opinions about Nora Webster but on the strength of the previous reviews, I might give it a try. But, there are so many books to read!! Too many books indeed. But all those comments about Nira Webster make me want to read it. I’m glad to hear you liked the book and the movie Brooklyn. I’ll have to keep The Blackwater Lightship in mind. Thanks. Haven’t read Toibin’s novels ever, which is odd. Am not sure why – he is ubiquitous in the media here, possibly I’m letting that bias me a little. Another possibility for your consideration: Academy Street, by Mary Costello. On the face of it a very similar tale to Brooklyn, but a wonderful exercise in restraint and suppression. I would be interested to know how you like him. I understand where you are coming from, though. It might put me off too. Thanks for the recommendation. I haven’t read Mary Costello. Isn’t it wonderful? I’m glad you enjoyed it, and thanks for the link back. I actually preferred this to Nora Webster (I reviewed that one too) but plenty prefer Nora as does Booker here and frankly both are so well written it’s almost meaningless to try to rank them. I started with his (I think) second novel, The Heather Blazing, which was excellent. His first, The South, is also very good. Just an extaordinary prose stylist. You are welcome. I agree, a wonderful stylist. Not the kind of prose one sees that often. Maybe it depends on which book one reads first. Good to know that you liked others as well. I’m curious to read his short stories. I could imagine he’s just as good in the shorter form. Oh, I admired this novel also. It is indeed difficult to put one’s finger on exactly what makes the prose so lovely. It has a way of washing over you like a gentle wave. The story is a common one, and Toibin breaks nearly every “rule”. I know several people who found Eilis frustrating at times. I wasn’t bothered by this as much, but I can understand why you felt that way. Do you think it is because she is a product of her era — she doesn’t have many options available to her so she can be passive. Only when greatly pushed does she exhibit courage. I’m so glad to hear you liked it too. That’s a great way to say it. It does wash over us and in a gentle way. I didn’t think she was a product of her era. Not only. Her sister is so different. It was something else. Like she was just watching, not fully participating. I hadn’t thought of him breaking all the “rules”, but you’re so right. I read this one, Caroline, but I was lukewarm about it. Too bad. Will you give him another try? Yes I will at some point. Have heard great things about this book and its author but have yet to try it/him for some reason. Thanks for putting them both back on my map. The movie adaptation was pretty good but not great, but I enjoyed the lead actress as I have in other movies: she is strikingly beautiful and a fine actress to boot. But I digress! I’d be interested to know what you think about him. I know that plot isn’t your main concern when it comes to books, so you might enjoy this. As Jacqui mentioned – he breaks all the “rules” which is refreshing. And his prose is stellar. I actually noticed I haven’t seen any movie with her. Or only one “How I Live Now” which I’ve already forgotten again. I’d like to watch this one though. Saoirse Ronan was also really good in a much different/smaller role in The Grand Budapest Hotel. Her performance in Brooklyn is actually my favorite thing about the movie, but I look forward to trying one of Tóibín’s books someday. If course, I saw that. Not sure why I forgot it. I hope you’ll give him a try. I’d be really interested to know how you get along with him. Forgot to say one more thing. Looks like there are many wonderful prose stylists coming out of Ireland. How does Toibin’s prose compare to John Banville’s? I’ve been thinking about this actually. I find he’s more accessible, more understated. No artifice, just luminous, uncluttered perfection I’d actually go as far as comparing him to the Joyce of Dubliners. I do think Joyce is even better but it’s not that far away while Banville has amazing moments but less compassion, less light. I need to read both again to be entirely sure. I really hope you will read Toibin and we can discuss some more. Thanky ou, Vishy. I hope you’ll read him some day. i’d love to hear what you think. I want to watch the movie too. It can’t be as good as the book but I’m sure it’s good in other ways. That just leaves me then… not having read Toibin! Been wanting to for ages, but never got around to it. There was a lot of hype that’s why I waited so long, I guess. I’m glad I finally tried him. I hope you’ll enjoy him as well. “Ellis never speaks up, never fights for herself and in the end, she pays a high price for this behaviour.” I felt the same, I think she is scared of what life may be saying no. That, and she is used to being domineered. I guess, that’s her problem and might have been the problem of many Irish women at that time. I would say her sister was rather the exception.